When governments attempt to persuade the people to their side, the rhetoric becomes so blatant it is stunning that the majority of people just believe what they are told. The typical tactic is always to paint your enemy as some “monster” as Trump just called Assad. You must always demean an opponent and the simple fact that they engage in that tactic exposes the sad fact that this is a deliberate manipulation. When it comes to the Russian President Vladimir Putin, the West portrays him as a dictator, strongman, bad person, and some sort of crazed Russian patriot who wants to dominate the world somehow. All this rhetoric is what we call phase ONE, laying the seeds to justify engaging in war. 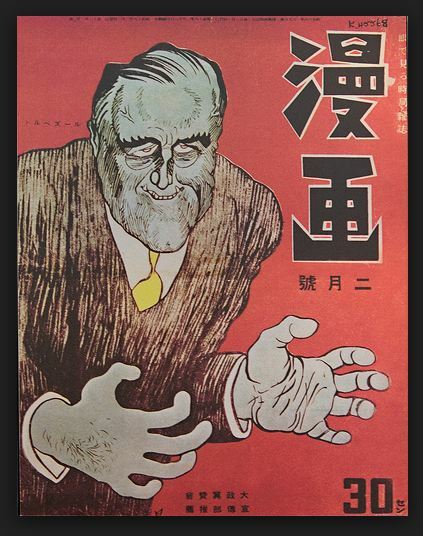 Here is a Japanese War poster demonizing Roosevelt. You will find that every side issues the same propaganda. This is indeed Phase ONE. You must get the people on your side to support the war effort. To do so, you must absolutely demonize your opponent. Ther point is not to defend Putin and try to show what is exaggerated propaganda. This is simply a standard method of raising support among your people. neither going to dispute nor support that characterization. Despite the West’s portrayal that Putin is some sort of “strongman” seeking to dominate the world, Putin’s popularity at home has only been increased. The sanctions the West imposed on Russia are his badge of honor just as the excessive reparation payments from people into the open arms of Hitler. The trade sanctions against China are doing the same thing. They create the reverse image that America is the evil power. These tactics are what lays the seeds for war. Phase ONE is so vital to creating the justification for war. Calling Assad a “monster” with no direct evidence that he even used chemical weapons has been a real joke. There is a pre-disposed agenda to invade Syria. That objective will be nurtured and propaganda is being used to move public opinion against Russia and Syria to justify yet another war for monetary reasons. However, the trade war against China is stirring a sleeping giant. China has never sent an army against another nation in modern times. Attacking China, which will see a recession, means that the people will blame an external enemy rather than internal. That will justify the support for entering the Middle East war. Ironically, Hillary’s manufactured charges that Putin cost her the election has come back to impose pressure on Trump to demonstrate that he is NOT beholding to Russia. If he takes a hard line, then it would be illogical that he conspired with Russia to win the election. Trump needs to be tough because of Hillary’s false accusations.